1. Despite being handsome, brilliant, rich, and nice -- in other words, prime marriage material -- Judge Roberts didn't get married until the relatively late age of 41. 2. With all due respect to the perfectly attractive Mrs. Jane Sullivan Roberts, some UTR readers -- not A3G -- have commented that the #5 Superhottie of the Federal Judiciary could have "married someone hotter." According to a UTR correspondent who used to work at Hogan & Hartson, Judge Roberts's former law firm, "many of the older [Hogan] attys are married to good-looking 20-somethings after having dumped their first wives." (b) While Judge Roberts was at Harvard, his pre-law advisor was William LaPiana, a law professor at New York Law School and an openly gay man. (c) One UTR reader commented that "Roberts has had at least one gay (male) clerk while sitting on the D.C. Cir. I suspect at least one other clerk as well." Update: It appears that Judge Roberts may have had one gay clerk. At the request of this clerk, however, A3G has deleted a reader comment referring to this clerk by name. Furthermore, she has disabled comments on this post. She thanks you for your consideration. 5. Finally, in terms of evidence of gayness, let's not leave out the notorious plaid pants. So there's certainly some grist for the "Judge Roberts is gay" rumor mill in the nominee's past (even if much of it is of dubious value). And now, tomorrow's edition of New York Times will throw more fuel on the fire, in the form of this rather interesting article about Judge Roberts's time at Harvard and what it was like to be a campus conservative there during the 1970's. 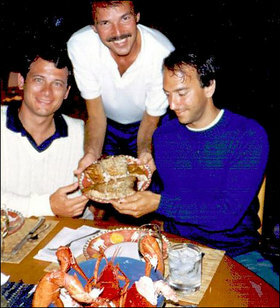 Second, directly to the left of the foregoing paragraph in the online version of the article is a photograph (courtesy Don Scherer) showing Judge Roberts hanging out on Martha's Vineyard with two handsome male friends, Don Scherer and Richard Lazarus. Call Article Three Groupie crazy -- you wouldn't be the first -- but the picture strikes her as pretty "gay-looking." John Roberts is gay! Look at those smiling buff friends snuggled next to the next Supreme Court Justice on Martha's Vinyard displaying the groumet meal they just made, and THEY will tell you. Now let's hope Roberts is actually confirmed before he's outed like a certain New Jersey Governor! Some legacy for Christian hero W. -- seating the first GAY Supreme Court Justice! * This is SO GREAT! Oy gay! Are we perhaps getting a little carried away with all of our rumor-mongering concerning Judge Roberts's sexual orientation? After all, the pic was taken on Martha's Vineyard, not Fire Island. And for the record, Scherer is married, as is Lazarus. More seriously, all of the "Is John Roberts gay?" speculation strikes A3G as pretty pointless, since it's doubtful that we'll ever get a definitive answer to the question. It's highly unlikely that Judge Roberts will show up in front of the Senate Judiciary Committee on September 6 and declare, "I am a gay American." We can hazard all sorts of guesses about Judge Roberts's tastes and proclivities, but we'll never know for sure. To sum things up, as A3G previously stated, "Is Judge John Roberts gay? Hmm, who knows?" Unless some new and truly compelling information emerges, let's just leave it at that. As far as A3G is concerned, the question of Judge Roberts's possible homosexuality -- like the matter of his two adopted kids -- should be shoved back into the closet. 'Nuff said! Update: Professor Althouse, despite being on vacation, had some interesting and funny comments to offer on the Times piece. A3G is inclined to agree with her: a good case can be made that the NYT is deliberately making Judge Roberts look gay. And yet, as Professor Althouse notes, "the deniability is intact as ever. It's just three men with a pie... and a mustache... and a glow." * Uh, who ever said that Judge Roberts -- if he is in fact gay, and if he is ultimately confirmed to the Court -- would be the first gay justice? Certainly not Wonkette: "Okay, serious now: We don't actually think Roberts is gay. We totally wish he was, though! Someone needs to keep Souter company."